It all began on facebook. Angela Casey, an environmentally savvy teacher at San Francisco's Lafayatte Elementary School, had been following the plight of the California sea lions on the Bonneville Dam via the facebook page Save Misty the Dolphin. The sea lions are being branded, hazed and lethally injected by state employees in Oregon & Washington for eating endangered salmon. 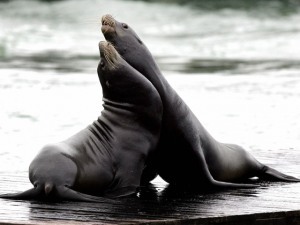 The states received special permission from the federal government to kill the sea lions. Since April 3, nine sea lions have been killed and one was taken into captivity. This just doesn't seem fair. Ms. Casey and her 3rd graders want it stopped. The students jumped on the chance to become part of Save Misty the Dolphin's Campaign How Kids Can Help Save the Bonneville Sea Lions. They drew pictures and wrote notes to Governor Kitzhaber of Oregon and Governor Gregoire of Washington, asking them to stop the sea lion killings. The kids started talking to kids in other classrooms. Soon there were hundreds of pictures and letters. We discuss the economics behind this issue. It's challenging. We understand fishermen need to make a living, but at what cost? My students and I feel there must be a better way that doesn't involve harming an innocent, federally protected (under the Marine Mammal Act) California Sea Lion. Based on the facts we've found (sea lions eat less than 4%, the dam takes 10% of the salmon, and fishermen take 17%, and birds 18%), the students feel it makes no sense to kill the sea lions...they also predicted that the birds would be next, and they were right. Being in San Francisco, the students are constantly exposed to the joyful and dog-like pinnipeds on the San Francisco Bay and they cannot understand why adults would want to kill them. Check out their page and support their campaign. According to the kids, "Alone we are a drop, together we are an ocean."